Regular readers and even new readers will soon come to see that I am a fan of rabbits - and as the 10th-18th May is Rabbit Awareness Week, I thought I would combine my love of these wonderful creatures with my latest module update: The Bestiary. To begin with, let us look at a picture of Daisy (who has now sadly passed away) when she had first come to us and used to run around like something crazy. Hence, she soon got the name, Crazy Daisy! While certainly not something to be afraid of (cue Monty Python sketch), she certainly knew how to grab the limelight. NB: The hutch in the picture below was NEVER used. All our bunnies were indoor bunnies and lived a life of indoor comfort - when not playing around outside of course. This hutch was what "Bud" (Daisy's "HusBun") had come to us in. Mind your toes - I'm coming through! So, how would Daisy fit in with the new Bestiary system I have planned for my module? Well, just like any new creature the PCs come across, or maybe read about, then there is a possibility that information about the creature will be noted to be recalled from accessing the journal; which has had a new TAB added to its design for such a purpose. A couple of creatures turned up to help demonstrate! 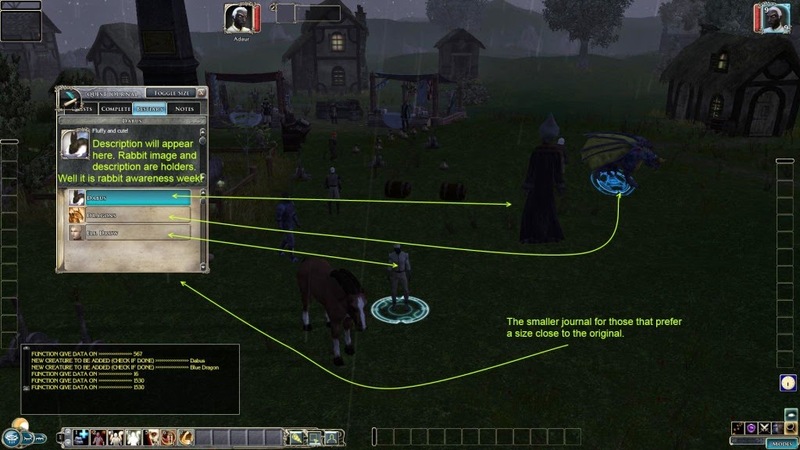 For those who may not be aware, I have also designed the journal so that it can be toggled between small and large scale to allow it to be more easily seen by the player. Here is a full screen image showing how big the larger journal actually is. NOTE: I am still working on the size of text for this larger version. Bigger journal option for easier viewing! A few weeks ago I showed you my new "Show Info" GUI, which helps to compensate for the missing functionality from NWN1, where a player could easily see where certain NPCs are at the push of a button. 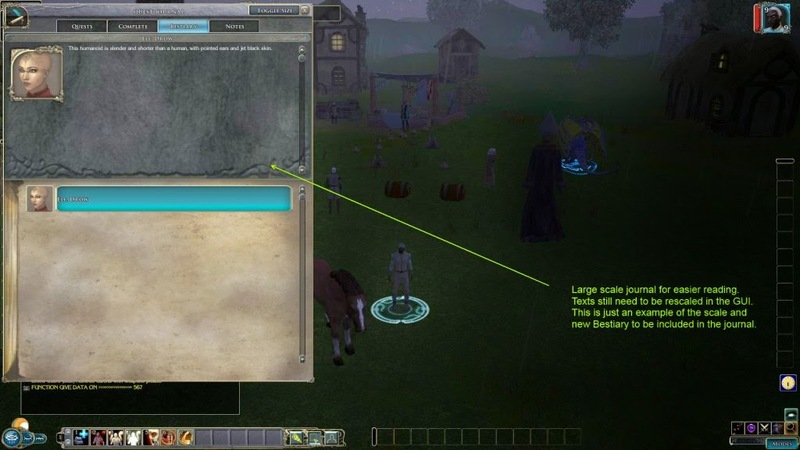 Below is a screenshot showing its new look, with a draggable top bar and tooltip in action. Note also, some creatures have different colour text to help denote whether they are "merchants" or more "notable" characters. Note the merchants stand out in BLUE text! More than this, however, is the fact that the button now also acts as a GUI toggle button to help minimise the amount of GUIs on screen if need be, for times when a larger viewing area (for when exploring or mapping) is preferred. Take a look at the difference when the button is used: It removes all hotbars and chat windows, which are easily toggled back again when needed. Much clearer without all those GUIs on - Let's go exploring! Daisy In Rabbiting On Again! Hurry up and take the photo! I want to go and play again! RIP sweetheart .. and to all my beloved pets I have lost over the years.